We have set the date for October 12th, 2019 at the Blaine County Fairgrounds in the Commercial Building. We are currently seeking sponsors for the event. If you are interested in Sponsoring, please contact Daniel Dahl at president@chinookmontana.com or call 406-399-3055. 2019 Proudly Sponsored by the following Community-Minded Businesses! A very special thank you to the following businesses. Without these sponsors, the Farmer Rancher Night event would not be possible. The History of Farmer-Rancher Night! The Chinook Area Chamber is bringing back Farmer-Rancher Night on October 21. The idea is to show appreciation to the farmers and ranchers for the economic contribution they make to local and area businesses. The concept follows a model used from 1970 to around 1996 by the chamber and local merchants. For many years what started Ag Appreciation Night attracted several hundred guests for a dinner and dance that sometimes lasted until 2am. Former and present ag nights were set in the fall after harvest was completed for most operators. Hayley Yost is the Chamber's current treasurer and heads the planning group for this year's Farmer-Rancher Night. Speaking about the event she said, "All Blaine County residents are invited to help show appreciation to our area farmers and ranchers." Business and individual sponsors will underwrite the event with their generous sponsorships. This year's event is presented by NorthWestern Mutual in partnership with Ag Succession Strategies, Valley Furniture Company and Bear Paw Livestock/Northern Livestock Video Representatives Dexter and Travis Buck and Kevin Elias. The first Ag Appreciation Day was organized by a committee of the Chinook chamber in 1970. Promotional stories in the county newspapers and ads read, "the celebration is open to all the county's farmers and stockmen and to all members of the Chinook Chamber." A news story following the first event noted that "800 farmers and stockmen from all corners of Blaine County, plus 68 chamber members and their spouses, attended." Folks who attended the first event, and subsequent appreciation nights, described the event as one of the largest gatherings in the county. Many guests wore formal wear with ladies often in long gowns or party dresses and men in suits and ties. 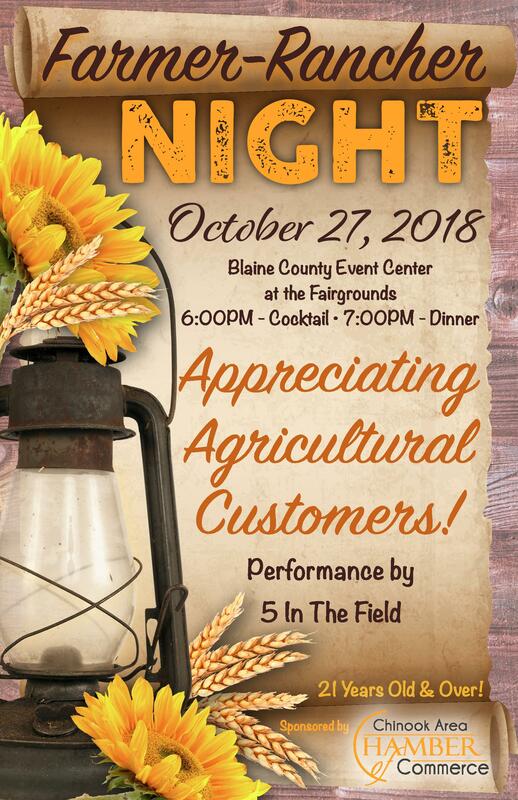 Held at the National Guard Armory (now the smaller building of the two that house the Blaine County shop in Chinook), the first Ag Appreciation Night was deemed a great success. In following years the numbers of guests continued in the 500-600 range. Don Berger, who chaired the chamber for the 1978 event, said, "To cook all the roasts and bake the potatoes we enlisted cooks and ovens all over town." Early on the morning of the event, the Chamber's cooking committee would meet at the VFW Hall to prepare the roasts, then take them to various homes, churches and facilities to be baked. Berger said, "One year we cooked 750 pounds of beef roasts, all in the 30-40 pound range. They were specially ordered and made up by a local meat shop." Late afternoon, before the dinner, the cooks would bring the cooked meat and potatoes to the armory, then another crew cut the meat and got it ready to serve to the guests. About the cooks, Berger said, "We had Sam and Swede Ehlang as our head cooks for the ag event. They were also the cooks for the local detachment of the National Guard. They were used to cooking for big crowds and they were great cooks." Others listed on the cooking committee for 1978 included Edgar Obie, Jack Sattleen, David Doughten, Bill Solem and Bob Graff. By 1982 the event changed focus a bit. That year the event was called "Customers Appreciation Day." In 1985 the appreciation dinner and dance moved to the Event Center (Commercial Building) at the county fairground. That year "a free grilled hamburger dinner will be provided for the community." Other years a dance, sometimes going to the wee hours, was a part of appreciation night. The 1985 dinner was concluded "in time to attend the homecoming football game" with a dance after the game at the Eagles. During that Saturday, before the dinner, there was a free matinee at the Blaine Theatre for children and many merchants held "Appreciation Day Sales." In 1986 the event reverted to the old name, Ag Appreciation Night. Ranchers, farmers and chamber members were invited and the Milk River Band was the musical entertainment for the dance. About 500 guests attended and a drawing for a trip to Las Vegas was part of the festivities. By the early 1990's the name changed to "Agriculture and Customer Appreciation Night" and all 'loyal customers' were invited to the beef dinner. There was dancing, but only until midnight instead of the wee hours of the early years. Searching local newspapers, it appears the last event was in 1996. After 26 years the ag appreciation night had run its course. Hayley Yost shared some of the plans for the 2017 ag appreciation event. She said, "No tickets will be sold. We are currently enlisting sponsors to support the cost of the event." The coordinating committee created different sponsor levels ranging from $100 for a Bronze Sponsor to Platinum Sponsors at the $1000+ level. "Several businesses and individuals," Yost explained, "asked if they could provide higher levels of support. Just recently we created the Diamond and Platinum Sponsors' categories." Sponsors will be recognized at the event in a variety of ways, depending on their level of support. Farmer-Rancher Night will be held at the Event Center at the fairgrounds. A no-host cocktail hour will begin at 6pm with dinner following at 7pm. During the original Ag Appreciation Nights, merchants and businesses could purchase 'drink tokens' which their guests could use at the bar during the event. Yost said, "We plan to have a means for businesses to provide drinks for their guests at the event, should they choose." All attendees must be 21 or over. Organizers of this year's event are planning for 400 guests. Yost said, "We had help from folks who were involved in the planning for the ag nights in the 80's and 90's and that's how we arrived at an estimate for the number of guests." While the focus of the night is to show appreciation to farmers and ranchers, Yost added, "We are welcoming anyone who wants to show appreciation. We will be accepting freewill offerings as well as sponsorships to underwrite the cost of the evening." If you are interested in being a sponsor for the upcoming event you can find descriptions of the various sponsor categories at the Chamber's website: chinookmontana.com. Or, contact the Chamber at (406) 357-3115 or by email at info@chinookmontana.com.